Millwall manager Neil Harris has branded the January transfer window a "shambles" after Middlesbrough striker Rudy Gestede turned down a move to The Den. The 30-year-old was one of Harris' top targets and agreed a deadline day deal with Boro to loan Gestede for the remainder of the season. However, the Benin international rejected a move to London - expressing his desire to fight for his place at the Riverside stadium. And his decision to knock back an offer from Millwall, 20th in the Championship table, left boss Harris seething. "We were very close," said the 41-year-old when asked how close he was to signing a striker. "There was a stage where I thought one was done. In fact, I thought more than one was done. Gestede is hoping to bounce back from a torrid 12 months blighted with injuries and begin to challenge Jordan Hugill and Britt Assombalonga for a first-team spot. 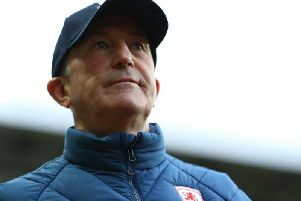 The former Aston Villa last appeared for Boro in the Championship against Preston North End last year, however started in the FA Cup win over Peterborough United last month. Boro travel to League Two side Newport County tomorrow evening in the FA Cup fourth round replay. Gestede is likely to be in contention.